Generate a certificate signed by our CA. In our case, we created a test program with the programming language "VB .Net" that we usually use for : Our programs. This is the program that we sign in this tutorial. If you choose to install "Microsoft Windows SDK ...", just leave the default options. Then, go to "Start Menu -> Microsoft Windows SDK 7.1" and click on "Windows SDK 7.1 Command Prompt". If you choose to install Visual Studio (in paid version), go to "Start Menu -> Microsoft Visual Studio 2010 -> Visual Studio Tools" and click on "Command Prompt Visual Studio (2010)." To create certificates (the authority + certificates issued by our authority), we use the "makecert" program. Note : In our case, we created a "cert" folder on the partition "D". - Either you have a server running Windows Server and you want to install your CA on this server. 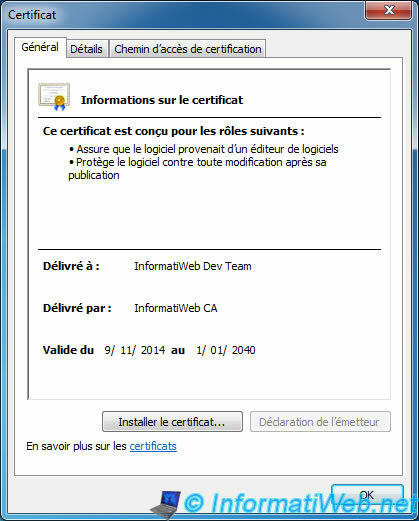 And then use the CA to generate your certificates (which you will generate using makecert). To do this, follow our tutorial : Windows Server 2012 / 2012 R2 - Create an Enterprise Root Certificate Authority (Root CA). - Either you want to create a Certification Authority in Windows using the makecert program. makecert -n "CN=InformatiWeb CA" -cy authority -a sha1 -sv "InformatiWeb_CA.pvk" -r "InformatiWeb_CA.cer"
- makecert asked to create a password for the private key and then enter it. - In our case, our authority will have the name "InformatiWeb CA" (CA stands for : Certification Authority). - If all goes well, the word "Succeeded" will be displayed in the command prompt. -n : Specifies the name of the certification authority that you create. -cy : Specifies the type of certificate. In this case : Certification Authority. sv : Specifies the private key file. In this case, it will be created and the private key will be saved in a ".pvk" file. -r : Creates a self-signed certificate. This option will create a root authority certificate (our authority not dependent on any known authority). "Certificate name.cer" : Name of the certificate in the ".cer" format, in which the X.509 certificate of the certification authority will be written. For your certificates are considered valid, you must import the certificate of your certification authority in the list of "Thrusted Root Certification Authorities" of your computers. To do this, refer to our tutorial : Import a certificate (of a root certification authority) in the trusted certificates list of Windows. Now that our authority is recognized as a trusted authority (only on computers which you imported the root certificate in the system trusted authorities), we will generate a certificate that will be issued (signed) by our authority. makecert -n "CN=InformatiWeb Dev Team" -ic "InformatiWeb_CA.cer" -iv "InformatiWeb_CA.pvk" -a sha1 -sky exchange -pe -sv "InformatiWebDevTeam.pvk" "InformatiWebDevTeam.cer"
After typing this command, makecert ask you to create the password of the private key of the certificate to generate (Subject Key) and then enter it. Note : If all goes well, the word "Succeeded" will be displayed in the command prompt. -iv : Specifies the .pvk private key file of the issuer (or certification authority). -pe : Marks the generated private key as exportable. This allows the inclusion of the private key in the certificate. -sv : Specifies the .pvk private key file of the subject. In this case, it will be created and the private key will be saved in a .pvk file. "Certificate name.cer" : Name of the .cer file where the X.509 certificate will be written. If all goes well, the word "Succeeded" will be displayed in the command prompt. -pvk : Specifies the .pvk private key file of the subject. -spc : Specifies the .spc certificate that contains the .cer certificate. 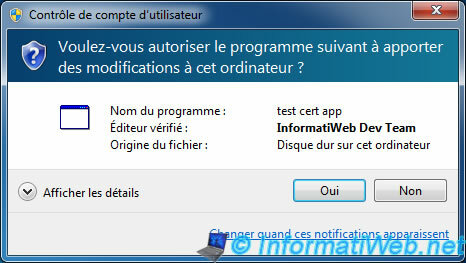 -pfx : Name of the ".pfx" file, in which the certificate will be created. Note : -po specifies the password for the .pfx file. If this parameter isn't specified, the password used for the .pfx certificate will be the one specified using the "pi" parameter. signtool sign /f "InformatiWebDevTeam.pfx" /p pass "test_app.exe"
sign : Digitally signs the file. 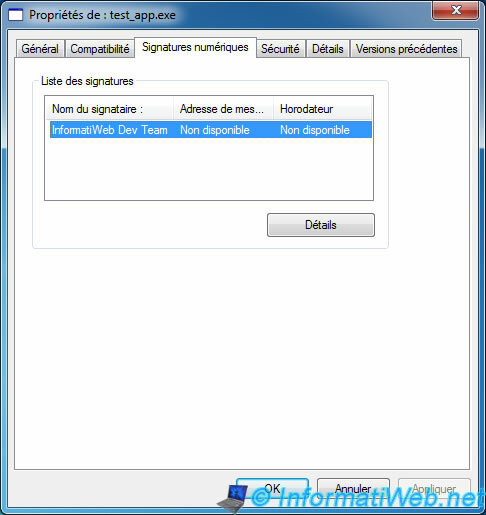 Digital signatures protect the file against falsification and allow users to verify the signer according to a certificate signing. "Certificate name.pfx" : Certificate to use to sign the file. /p : Specifies the password to use when opening the file PFX. "the file.exe" : File to digitally sign. Now that your program is digitally signed, a "Digital Signatures" tab has been added in your file properties. 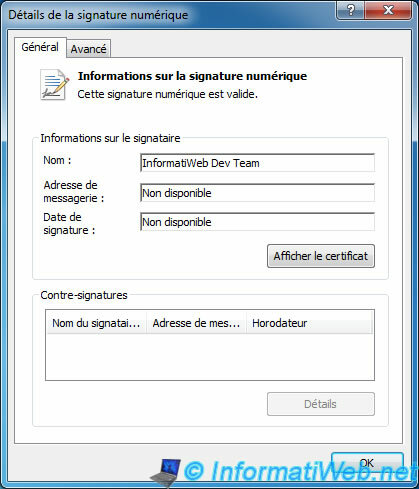 In the details of the digital signature, you will see the name (InformatiWeb Dev Team in our case) and the line "This digital signature is valid". By clicking on "View Certificate", you will see the certificate itself. Indeed, if a hacker trying to hack your program distributed as a trial version, the digital signature will be invalid. Final difference : when you launch your program as an administrator, the Windows UAC will show the line "Verified Publisher : InformatiWeb Dev Team" with a blue headband instead of orange.